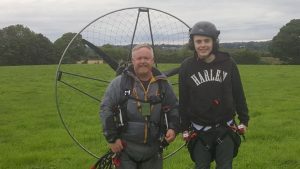 Paramotoring in Ireland this year didn't have great start, to be honest. We are delighted that weather improves a bit and we have had first flights and training days!!! Soon enough we plan to start tandem flights for adrenaline seekers and also as an introduction to our training. Ask for more details, as course is highly weather dependant. We are using excellent quality Dudek wings and light and powerful AirConception paramotors!